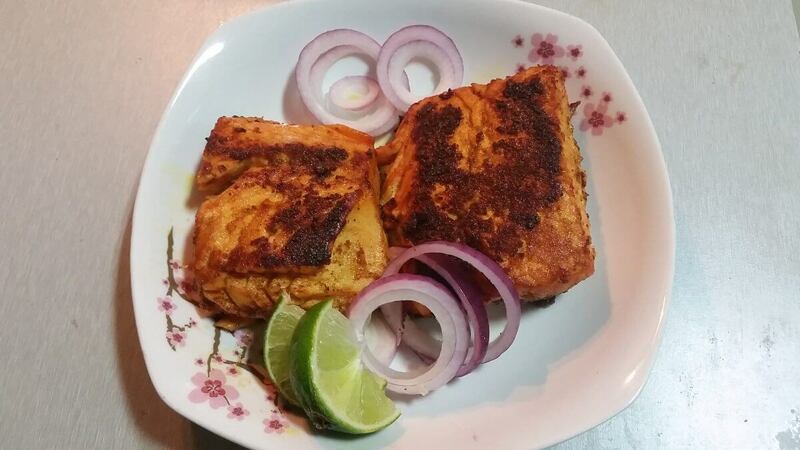 Wash Salmon with turmeric and Lemon in running water. Now mix all the spices( Ginger garlic paste,Turmeric Powder,Cumin Powder,Coriander powder,Chili Powder) with Curd and Salt to make a thick smooth paste. You can use little amount of water to make paste if required. Now coat salmon with this paste from all the sides and keep it in refrigerator for half an hour. Put salmon pieces in pan and fry from all sides until it gets cooked from all sides. While cooking, you can cut it into small pieces to cook properly from all sides. Once cooked from all the sides, take it out and serve hot with onion and lemon.